Triton Sound Village, one of the smallest villages in New Seabury, is comprised of two streets, Triton Way and Shore Drive West, which are located just off the Greensward rotary. There are 31 homes, ranging in style from contemporary to shingle style Victorian, as well as 1 lot left to be built on Triton Way. Many of the residents have been here from the early years of New Seabury, so there is much history in our village. Over the course of time, some of the older homes have been demolished to make way for newer homes, and many of the existing homes have seen renovations to keep up with current trends. There is a mix of seasonal residents as well as many year-round residents. Triton Sound Village enjoys the best of both worlds…many homes are direct oceanfront or have stunning ocean views, while some enjoy breathtaking vistas of the adjoining golf course which is in close proximity to the New Seabury Country Club. 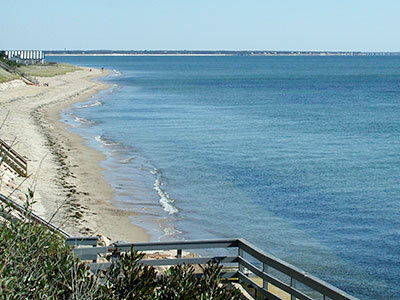 With direct access to a 3 mile beach on Nantucket Sound via a residents right-of-way, each home has deeded beach rights. We are centrally located within New Seabury within walking distance of the Popponesset Marketplace, Popponesset Inn and Beach and Cabana Clubs, as well as the beautiful New Seabury Country Club. We take great pride in our little village and strive to keep it neat and attractive with newly paved roads and fresh landscaping of common areas. The old fashioned gaslight lanterns at the entrance to our roads is a reminder of our past, while the newly enhanced entrance to Shore Drive West at the 18th hole of the Ocean Course, accented by a beautiful stone wall with many seasonal plantings, is a glimpse into our future. We look out for one another as friends and neighbors and extend a helping hand wherever it is needed. Whether you are watching a beautiful sunrise over Nantucket Sound or a golden sunset over the golf course, you will find yourself in the midst of the true beauty of Cape Cod!